I made it to Alaska in one piece and am settling in. Taking my stuff to be mailed was an adventure in itself. I recruited my friend Chad to help me. 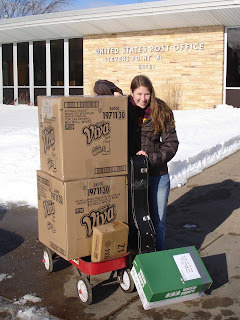 I had two large boxes roughly 50lbs each on top of the guitar, a box of books, and a gift for a friend. I busted out my old radio flyer wagon to help move the boxes from my car into the post office and let me tell you, we got some looks. I'm sure it didn't help that I had my picture taken with everything in the middle of the sidewalk, but the wagon squealed when you rolled it causing heads to turn. The lady I worked with I don't think was too pleased dealing with those heavy boxes and my mislabeling, but she wished me luck and more heads turned as we rolled an empty wagon out of the post office. The cost of shipping everything? $150. The last week and half in Wisconsin couldn't have been better. All kind of people came home for the holidays and I spent night after night going out and seeing old friends from high school and UWSP. I had so much fun hanging out with my good friends going downtown which I never do. Though I did have to wash my clothes after each night due to the smoky smell, good thing Alaska is smoke free. I went sledding after more snow had fallen. Within no time at all I was leaving Point for good heading to Chicago. In Chicago we stayed at my friend Dann's place above a funeral parlor. You'd never know it being there. I spent Sunday morning before leaving for Chicago playing with my animals and giving them as much attention as possible. It hadn’t sunk in yet how much I was actually going to miss them, I just knew it’d be hard for them when I left. It was a very sad goodbye to walk out of the house and close the door on them. The drive to Chicago was 3 hours of winter wonderland. The trees were all beautifully blanketed in snow that it looked like something from a professional photograph. By the time we were in Chicago the snow had begun to disappear. Chicago was a blast hanging out with my good friends. New Years Eve us ladies ditched the boys to go to a party elsewhere in Chicago. They had the Rock Band video game, like Guitar Hero only you have four people play in a band. I’d never played it before and I got stuck being the singer but we all had a fun time showing off our lack of video game talent. We managed to sneak in a few hours of sleep before getting up at 6am to get ready to leave. It was the start to a very long day of crappy traveling. I barely made it through security in time to get to my first flight only to find the plane wasn’t even there. My layover in Vegas was a short one so it was possible I was going to miss it so the airline double booked me on another flight that would leave much much much later. I was very hopeful I could catch this flight, however, that was not the case. I was about 5 minutes too late. If it were a clear hour or more maybe it’d be a little less frustrating, but we waited to dock for a good ten minutes because another plane took our spot at the gate we were assigned. So my once 12 hour travel experience turned into 23 hours. I had to go to Phoenix before I could go to Anchorage and whole lot of waiting in-between. Yes, you can gamble in the Vegas airport, I didn’t though. Three uncomfortable flights later and at 1am Alaska time (4am to my body) I finally landed in Anchorage. Matt and his friend, Robert, were there to greet me and we went out for pizza and drove around to get me acquainted before I was dropped off at my new home. I didn’t go to bed till 3:30am so I slept very late to catch up for two nights of little sleep. The following days were just me being at the mercy of my driver friends Matt and Robert. I hadn’t met Bill, the guy I am staying with, till late Wednesday evening after he got home from work. Wednesday, my first official day in Anchorage, Matt took me to brunch at a place where the waiter took my Wisconsin license (it was a bar restaurant so I had to show my ID) and his response was “My parents grew up in Stevens Point” followed by “Yeah, Anchorage has the largest Packer fan base outside Wisconsin.” He wasn’t kidding, I’ve seen Packer flags outside people’s houses. Well after a great meal (which included one large crab leg... 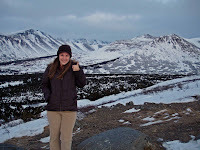 I guess I didn't get my fill on Christmas Eve) Matt ran away to do stuff and I spent time with Robert who took me to a place called Flattop where there was supposed to be a good view of Anchorage and the Chugach mountain range, including McKinley. Sadly on the cloudy day that wasn’t the case however, the clouds were low and though they covered the city, I still got a great shot of the sun setting and some of the closer mountains that didn’t get swallowed by the clouds. Then I came back to Bill’s to meet him and Matt, Bill, and I went to the rock climbing gym. Bill is a fantastic guy who I will learn lots from. He’s a big outdoor enthusiast and has expertise in all the things you can imagine: skiing, climbing (rock and ice), mountaineering, diving, and his big passion is big game hunting. Since I’ve been hear I’ve been eating the meats of most of his kills. Since my big interest here is to ice climb he has offered to become the mentor to us, so instead of going through some expensive company we will be doing it for somewhat free. He has all the gear and know how so all I need is to learn what he knows, get buff from the rock climbing gym, and get good at rope management. The rock gym is phenomenal, as well as the climbers in it. The following day was a lazy day and by 3pm I was on the road with Bill (Matt to take a plane later) to the Kenai peninsula where Bill has a cabin that he calls the Fox Farm, which is more like an impressive house than a cabin. Despite the cloudy day the drive down the famous Seward Highway was impressive. There is a stretch where the road is snuggled between the ocean and cliffs, and on those cliffs are frozen waterfalls, lots of them. This is where a lot of people go ice climbing and we sure did see many out there doing just that. It’s not safe to be so close to the highway and Bill, of his many amazing and crazy awesome stories, has informed us of incidences of falling rock. He was climbing once when there were sheep above who were knocking down rocks, not only on them, but onto the cars. It’s pretty common to hear about people getting a windshield smashed out from falling rocks… or the road closing from an avalanche. It’s apparently a pretty dangerous highway in general. So the cabin is located in a town called Kasilof. A lot of famous pioneers were from the area, such as Andrew Berg. I met a man whom Bill calls one of the last living pioneers and informs me of the honor it is to know him… his name is Per Osmar, there is a road named after him. He’s in his 90s now, but seems to be still active and gave me signed photos of his photographs of Redoubt Mountain (which is visible from Clam Gulch beach as seen in the video below… though you can’t see Redoubt in the video). He’s a sweet man and well respected. My first full day in this new territory 3 miles drive south of Anchorage, I took on a cross country skiing adventure with Bill (Matt didn’t have skis). It was about 4-5 miles long and after getting well into the path we ran into what Bill calls over flow where there was tons of ice on our trail. 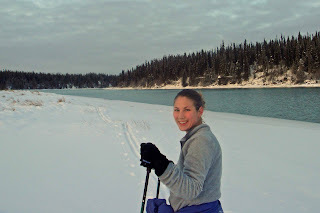 We skied to the Kasilof river which is just an amazing aqua color. I think you can fish for salmon in it, but the Kenai river, which we passed often while driving, is the famous one for salmon fishing. People pay thousands of dollars to fish on this river every summer. The path along the river was a bit sketchy and we had to take off our skis at a point, but it certainly was fun. I was pooped at the end, feeling every muscle in my body aching. Unfortunately, I’ve been trying to fend off this cold I picked up from the plane so my energy level was a bit lower, however, it wasn’t enough to hold me back from enjoying outdoor Alaska. We even saw moose on our trip, my first sighting! (and will be far from my last). At night Bill treats us to amazing meals he cooks and we sit around and chit chat about life, love, politics, and share stories. Bill has many. 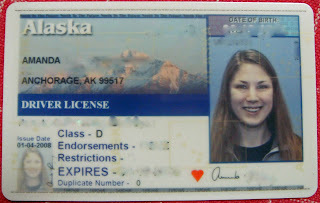 While I was in this smaller community it was thought best to get my Alaskan license here. 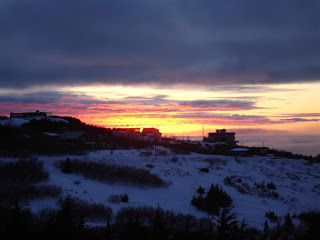 I’m officially an Alaskan now, sad to give up my proof of Wisconsin identity, but happy to be officially living here. 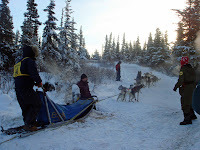 (Most information I fuzzed out on the license so I could put it up here as show and tell) The second day at the cabin we went and saw the beginning of a 200 mile long dog sled race. The noise from the barking was so intense, but it was exciting! All these big burly men and beautiful ecstatic dogs ready to race. They start one by one, not at once and we watched a few of them go. It was so cool. 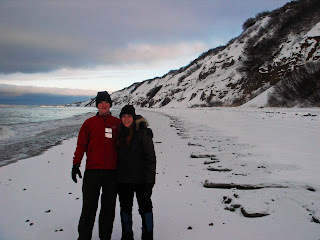 Then we went a walk along the Clam Gulch beach where just across the way you could see mountains. It was beautiful. We did one more ski and then had a cold beer on the deck overlooking the Kenai river at the Fox Farm with Bill remarking “You’re a true Alaskan now”. One of my biggest fears of how to get around Anchorage without a car. It’s not really an easy task and they don’t have some amazing transportation system. The city reminds of a city in Wisconsin like Appleton or Wausau, no tall buildings, just a lot of land and people. So Bill, being a very laid back and amazing guy, offers me to use one of his vehicles. He has a massive Subaru which is nicknamed “the Monster” for very good reason and a red car that is a stick shift. So when we got back to Anchorage my first task was the learn stick shift so I could drive the red car. Matt took me to a parking lot where I practiced and then assumed the role of being the chauffer for the evening taking Matt to the airport (so he could return to Juneau for work) and Bill to the grocery store. So here I am, no knowledge of how to drive a stick shift, learning in the dead winter of Alaska in one day. So on Monday, the first day I’m on my own, I took the car out into Anchorage traffic on my own to run some chores. An adventure that certainly was, however, I was only honked at once. I apparently picked up the skill rather quickly Bill says, but I still feel a little nervous being on busy roads where if I stall, people have to wait. I plan on putting a sign in the back window saying “Just learning stick shift, please bare with me” and I’m sure people will be more forgiving. People are very friendly here. On my way home from my adventure in the stick shift car, I was just about to turn onto my road when out of the corner of my eye I see something that makes me think “weird why people put those stupid billboards of moose in their yard… wait… THAT’S A REAL FREAKIN’ MOOSE!!! !” Bill told me there would be moose all over where he lives but it’s the first I’ve seen one that close! Of course I get out and take pictures and the following video. She seemed real calm and I didn’t get close. However, walking back to the car I notice that the moose prints in the snow go through our yard so I should keep my eyes peeled from now on. And for the record, half of my stuff arrived on Monday in the mail. That was only two weeks and the majority of my stuff. Amazing. Monday night I went out with some of the folks from the local CBS news here. I was grateful to be picked up (because trying to find your way in the dark in an unfamiliar city while you’re just getting used to stick shift seemed a smidge too intense for me) and we went to the famous Humpey's. I may end up going camping this weekend out somewhere so that I can take pictures of the Northern Lights and do some hiking this weekend. So things have been good so far. I miss my animals a lot. I'm on the job hunt but not being very aggressive about it because I want to hold off on the start date till after I road trip California coming up. No dates are set but should be soon. I'm totally winging it right now hoping things will fall into place. Sometimes I still can't believe I just up and moved like that. I hear a lot of "I hope you like Alaska" from the locals and it's really nice. So far I do. I'll feel a lot better when I have a job though. I hope everyone is doing well and had a good New Year. I'm so glad you're blogging, so fun reading about your travels! Impressed by how fast your picking up on shift driving btw, it's not an easy adjustment..
great job wasting no time getting your alaska id! :) i'm glad to read that you're off to such a great start. love you!